Winter in Upstate NY usually means snow — and lots of it! 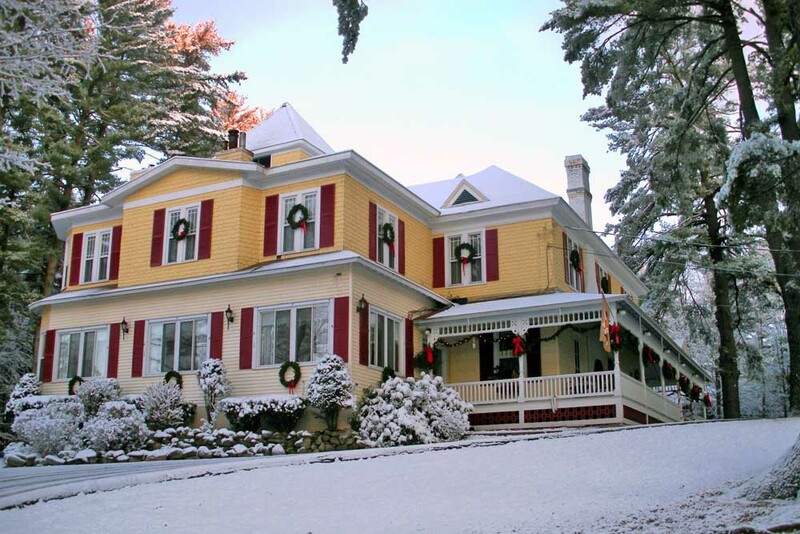 Planning a romantic winter getaway with your sweetheart in the Adirondacks? Don’t let the winter stop you! The cold weather brings with it a wealth of unique and fun activities to do in the Adirondack, Lake George, Lake Luzerne and Saratoga Springs areas and thoughout Upstate NY. No matter the time of year, there are always special events going on and plenty of things to do. We’ve put together a list of the top 5 winter activities you’ll want to try on your next winter weekend getaway to the Lamplight Inn Bed and Breakfast! Enjoy the winter landscape, the exhilaration outdoor activities can bring, and then spending the evening warming back up at our Adirondack inn with that someone special. See our top picks for winter fun and see why a winter vacation in the Adirondacks is both romantic and relaxing! Skiing at Gore or West Mountains: The Lake Luzerne area offers several nearby ski resorts where you can enjoy skiing and snowboarding as early as November and as late as April. Even if there is no snow in the forecast, these mountains make their own snow ensuring perfect skiing conditions throughout the season. Cross country skiing: Slow things down a bit with a scenic cross country skiing or snowshoeing adventure. This is a wonderful way to explore the beauty of Lake `George while getting some great exercise! Snowmobiling: Freshly fallen snow beckons snowmobilers to hit the trails. Lake George offers miles of trails, sledding on the lake and access to Adirondack trails. Snowmobile rentals and guided tours are available. Ice Fishing: Locals and visitors alike love spending a day on the ice taking in the breathtaking views and hoping to land a trophy fish! Salmon, Lake Trout, Yellow Perch and Northern Pike are in season, and fishing guides can show you the best spots to find them. The Lake George Winter Carnival: Winter Carnival weekends are held over the four weekends of February, with the kick-off being the New Year’s Day Polar Plunge. This annual Lake George event is free and offers events and activities the whole family can enjoy! After a day spent exploring the splendor of the great outdoors, head back to your suite in our Adirondack Inn, and spend the evening by the fire, enjoying hot chocolate with marshmallows and home-baked cookies. Spending your winter in the Adirondacks? Check out our availability and the specials and packages page, and start planning your winter getaway today!